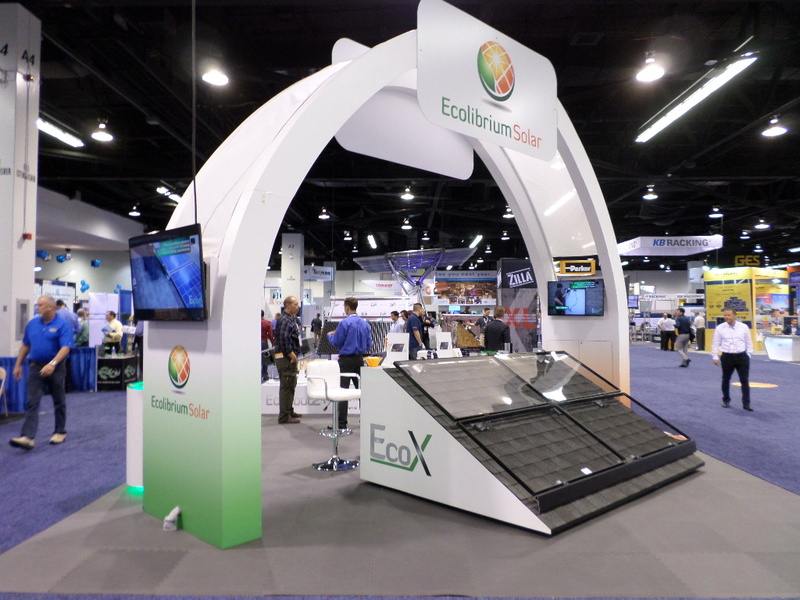 Ecolibrium Solar had a range of products on display this year at Solar Power International in Anaheim, CA, 2015. The show was very well attended, and the The Ecolibrium Solar team had a great experience at the show. “We had a great turn-out for SPI this year. The show was a great opportunity to meet with many of our existing customers, and we had great opportunities to connect with new customers as well.” Said Nate Randall, Director of Sales for Ecolibrium Solar. The Ecolibrium booth had great traffic from contractors and EPCs in both the Residential and Commerical space. The new, second generation version of the EcoX rail-less residential racking solution was showcased in the booth. On the commercial side, the EcoFoot2+ ballasted flat roof racking system was on display. In addition, the new EcoMount ballasted inverter mounting solution, as well as a new EcoTray solar wire management solution were featured as new accessory solutions. In total, the booth received great traffic throughout the show, and was the perfect venue to meet with customers and showcase the Ecolibrium product offering.